As head of a children's daycare center run by the international non-governmental organization SOS-Kinderdorf (SOS Children's Villages), it is my job to help keep children safe. But now, trapped in Aleppo, I fear for the safety of my own unborn child. I worry about my unborn child every day. Will I give birth to it in a city where even hospitals are being bombed? Even if I managed to find a decent clinic, the frequent power cuts could put my baby's life at risk. Many newborns have already died in their incubators due to power cuts. Even if my baby was born safely, I wouldn't be able to provide it with a normal life. Where would I buy diapers and food? Even if any of these were available, I probably wouldn't be able to afford them. As of now, I can still afford fruit and vegetables. But making sure I get enough minerals and vitamins is proving to be very difficult and expensive. The roars of war make me shiver. The ambulance sirens reminds me of how easy it is to die in Aleppo. I live a mile away from the city center. We are not being bombed very often over here, but I still live in constant fear. In July, my husband and I narrowly escaped death when we decided to make a trip to a supermarket that was hit by a shell on the same day. If we had entered the supermarket a few minutes earlier, we would have also been killed. We don't feel safe anywhere. 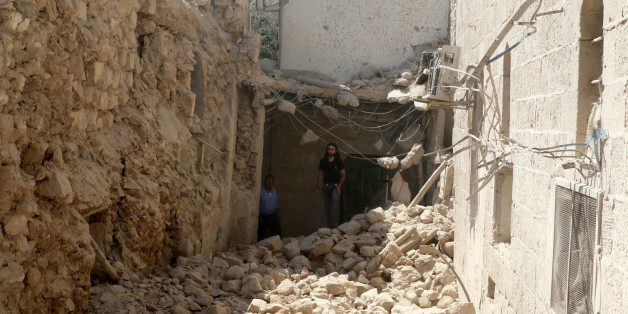 But that's just the way it is: We are trapped in Aleppo and we have to deal with it. Finding drinking water is one of the greatest challenges we have to face on a daily basis. The water that is currently available in Aleppo is unsafe to drink, and leads to stomachaches, particularly among children. It also causes rashes. And I think to myself: If I can't even afford clean drinking water, how will I be able to provide for my child? My baby could already be sick. I keep hearing that deadly gas is being used in Aleppo. I don't know if that's true -- but I live in fear that this deadly gas has already reached the lungs of my unborn child. I don't want my baby to be a child of war; I want it to have a chance for a normal life. Day and night, we keep hearing the sounds of bombs and gunshots. Two weeks ago, a cartridge ended up in our bedroom. When my baby moved, I felt grateful -- I could tell it was still alive. I want my baby to be born healthy, outside of Aleppo. I don't want my baby to be a child of war; I want it to have a chance for a normal life. I have been working with the aid project SOS Children's Villages for the past 12 years -- since I was 18 years-old. I have been working hard to safeguard children's rights, and I want to guarantee these rights for my baby too. I want it to grow up happy and safe -- nothing else matters! This post first appeared on HuffPost Germany. It has been translated into English and edited for clarity.